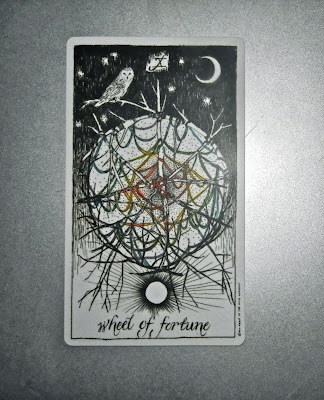 Today's Draw: The Wheel of Fortune from the Wild Unknown Tarot. Do you keep having the same unpalatable situations or kinds of people showing up in your life? What clues might you be missing that could help you rise above? Or is it possible you actually enjoy wallowing in your hard luck story? We had the Wheel of Fortune yesterday. So the universe is trying to tell us something this week. 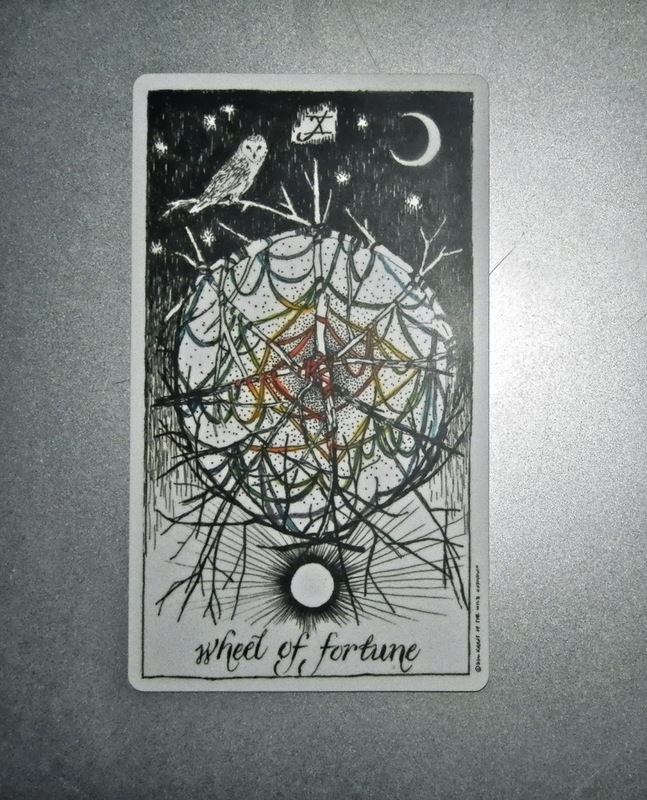 The Wheel is all about cycles and the variable nature of life—sometimes you're on top, sometimes you're on the bottom. Personally, I see life as a spiral. We have the opportunity to raise our lives forever upward in a spiraling motion. But if we don't use the turn of the wheel to learn and grow, life tends to be more like a circle. If you tend to attract the exact same situations and people, then you're moving in a circle. If the same kinds of people and situation come into your life, but not as powerfully or painfully as the time before, you're moving in an upward spiral. Earlier this week we talked about how one way to change a situation is to change the way you approach it some way. If you always spill coffee on yourself walking from Starbucks to your car, do something different. Fill your cup less full. Use one of those stirrer things that seals the hole. Hold your cup farther away from you when walking. There are many things you can do differently. But if you keep doing things the same, you'll just be stuck in a circle. Do something different and your next coffee issue will different or you'll cease having coffee issues. But there's a lot more to it than that. You need to be aware of what's going on around you. Let's say you keep attracting needy people. Needy people carry a big sack of clues pointing to their neediness along with them. So if you're oblivious to the clues, you'll move in a circle. If you excavate your situation and become aware of the clues, then hold people with those behaviors at arm's length, you'll move in an upward spiral. You may still attract needy people, but they will come with different clues and they will be a different kind of needy. The more you spiral, and the more you learn about the things you do to attract neediness, the further you get from the issue until you no longer have it. So being aware of the motivations, behaviors and circumstances around you helps. But then you've also got to learn the lesson. A situation will repeat itself over and over until you learn the lesson. And sometimes the situation will escalate if you refuse to see the lesson. And the fastest way to have a situation repeat and repeat is to be a victim...to be the person who did everything right, but is surrounded by everything and everyone wrong. Victims are people who voluntarily hand their power over the situation or person that hurt them by focusing on their pain, focusing on the other person or slipping into denial. The only way out of victimhood is to focus on your own personal responsibility and/or reclaiming your power. So take a look at what's going round and round in your life. Is it getting better, coming less frequently and teaching you new lessons? Then just keep working on it and it will eventually disappear from your life. But if the needle just doesn't seem to move, it's not the situation or other person that's the issue. It's you.